A Laryngotracheoplasty (LTP) is an upper airway reconstructive procedure utilized for patients with severe airway obstruction of the subglottis and/or tracheotomy dependency. This procedure has revolutionized the care of severe tracheotomy dependent patients of all ages and optimally expands the patient’s upper airway. The subglottis is the area just beneath the vocal cords. This area is particularly prone to injury from intubation. This leads to scarring and narrowing (stenosis) of the available airway with decreased airflow to the lungs (Figure 1). A direct examination of the airway in the operating room is indicated to correctly measure the nature and extent of stenosis. Some children will require pulmonary and/or cardiac evaluation and a barium swallow to determine if they are candidates for an LTP. A flexible fiber optic examination of the vocal chords (sometimes performed in the clinic) is necessary to determine the mobility, opening and closing of the vocal cords. A LTP is now considered the mainstay for the treatment of severe subglottic and tracheal stenosis. Cartilage is harvested from the sixth to eighth rib. 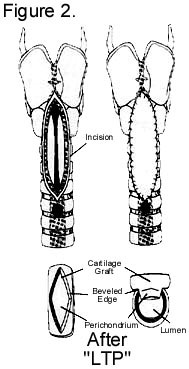 The cartilage is shaped and then sewn into the cartilage edges of the tracheal incision (figure 2). This opens the airway substantially to allow greater allow flow. For severe lesions, in addition to an anterior (front) graft, a posterior (back) graft of cartilage can be sewn into place. As this is the patient’s own tissue, the rib cartilage grows as the patient and trachea grow. The initial procedure may include decannulation (removal of tracheotomy tube). If this is planned, the patient remains intubated with an endotracheal tube, ventilated by a respirator and sedated for several days. This allows time for the graft to strengthen and heal. Extubation (removal of the endotracheal tube) will follow. This sometimes requires a follow up visit to the operating room. If the LTP does not include decannulation initially, a tracheal stent is inserted to support the graft. This stent is made of silastic, which is flexible and open. 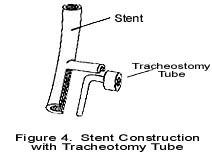 The stent is modified in order to accommodate the placement of the patient’s tracheotomy tube in front and below it (Figure 3). The patient may be ventilated through the tracheotomy tube postoperatively for a few days. This LTP approach includes stent removal and possible decannulation 6-8 weeks after the initial procedure. 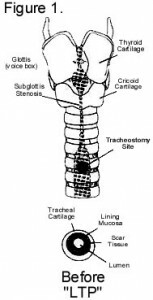 Ifyour child has a tracheotomy tube and stent, i.e., tracheotomy, tube change “feels” slightly different. When changing the tracheotomy tube, make sure the stent tab is visible above the tracheotomy tube, hold onto the stent tab with one hand, while extending the neck slightly, then insert the tracheotomy tube “back” and then “down” with the other hand. 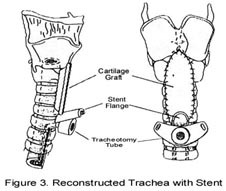 This technique assures proper placement of the tracheotomy tube and stent (see figure 4). Make sure the tracheotomy tube is lubricated to ease insertion around the stent. Your child will still need to wear a audiorespiratory monitor while sleeping or at rest unless the doctor instructs you otherwise. Strict precautions are encouraged and no swimming allowed until advised. Will My Child Be Able to Speak? The voice is remarkably intact after decannulation; however, it may sound hoarse or harsh. Also, your child’s speech development is dependent upon many factors, such as age, physical condition, and postsurgical recovery. If there is persistent hoarseness or a delay in your child’s speech development, speech therapy or other procedures may be recommended by your physician.